Well another year is nearly over and after two glorious days of summer weather, mum, dad and I are heading off to Ewan's for Christmas and holiday. It will be fun as next week Stephanie is joining us so we get to be tourists again, travel to Las Vegas , Grand Canyon and who knows what else. I will be updating this post over the next 24 hours as we travel through the night to get there this morning. A conundrum of time travel. This year has been interesting with several stressful times at school, changes in our staff and processes which haven't always been explained well. Embroidery went well with most of the stitching on my major canvas being done, walk on the wild side is nearly complete. I have only one side to stitch on odyssey so that is good. Heart of a cabin is being given to mum for stitching in the new year. Lots of other smaller projects have been completed, especially if you follow this blog you will have seen some of them. I have several more small canvas pieces to turn into bags which is a good use for them otherwise my walls would be full. I am still a demonstrator for Stampin up products and card classes once a month at my place has been fun with Megan and a core group of ladies. I have managed to spend up large most quarters without realising it so that is keeping me current. Now I need to find an outlet for my cards so I can make more to sell but not in Taranaki I feel. I have designed another new ball this year and taught the class as well as made it in two colour ways which both looked good. I did not get as many made for Christmas presents as usual as time was at a premium this year. I will have to start way earlier in 2015. 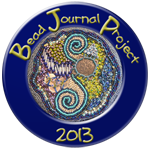 A goal was to learn to use the bead design software but i did not do too well. Sonia and I met most months to stitch, eat and dictate her stories and we have one nearly written. Next year we will have to write more. I think I might ask her to record herself when she is telling the story so it can type at my leisure. It is real fun and I want to see us get one completely written. Must go now as plane is here. 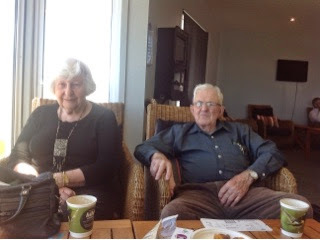 Mum and dad relaxing at New Plymouth airport before we depart.